With its patented technology, Turbomixer is the solution to your mixing problems. The mixer works by sucking in the material through the coils and ejecting it out of the ends. 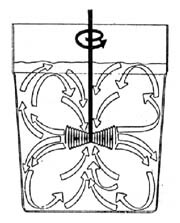 The vacuum, created by the mixer, draws larger pieces of material towards the propeller and holds them near until small enough to pass through the coils. Because the flow through the coil is very rapid, the material is subject to high rates of acceleration and directional change causing large chunks to be broken up and a homogenous mix to be achieved quickly. The coil has proven superior to prior art impellers, cutting down on mixing time to 1/3 that of other mixers in tests of mixing, blending, dispersing, emulsifying, and aerating at shaft speeds from 60 to 5000 rpm. Turbomixer mixing coils work equally well in either rotational direction. The mixer should not come in contact with the sides or bottom of the mixing container. 304 S/S now standard to increase material compatibility. Varied pitch coils standard on 5 gal. and large mixers improves energy efficiency by 10%. All coil ends are machined with chamfer to prevent plastic container chaffing. S/S fastener that retains the coil (except on C-8 kit), provides long term, positive mixing coil retention in continuous unattended production settings. Coil wire is now peened after winding and heat treating, resulting in less stress on the mixer. TUP8	 P8	 QUART	 1/4"	 8" / 1 1/2"
TUQ12	 Q12	 1/2 GAL	 1/4" 12" / 21/2"
TUR12	 R12	 1-2 GAL 3/8"	 12" / 3 1/2"
TUS16 S16	 21/2 GAL	 3/8"	 16" / 4 1/4"
TUS24	 S24	 3-10 GAL	 3/8"	 24" / 5"
TUT36	 T36	 11-55 GAL	 1/2"	 36" / 6"